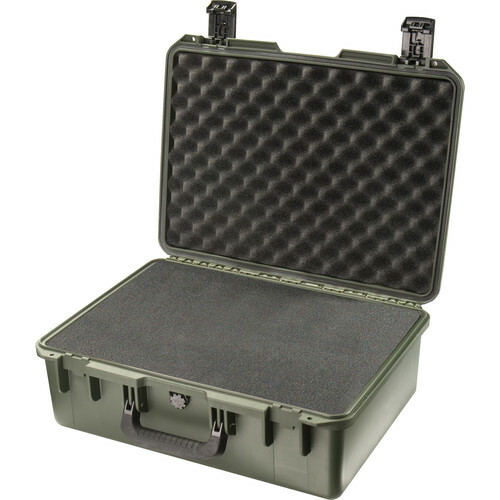 The Pelican iM2600 Storm Case with Foam (Olive Drab) is an injection-molded case made of HPX high performance resin, that is virtually unbreakable, dent-resistant and shatter-resistant. It is tough, rugged, lightweight, airtight and watertight. There is a permanently attached Vortex valve that automatically adjusts air pressure without letting in water, and won't unscrew from the case. Press & Pull latches open with the push of a button, yet stay closed securely under impact or stress. The case has unbreakable molded-in hasps that allow the addition of standard size padlocks. It has hinges with integrated feet that hold fast under impact, and create a flat surface for upright stability. It is carried by a double-layered, soft-grip, solid-core handle that provides strong, durable comfort. Box Dimensions (LxWxH) 21.8 x 16.6 x 8.7"
iM2600 Storm Case with Foam (Olive Drab) is rated 4.9 out of 5 by 38. Rated 5 out of 5 by The Moto Channel from Perfect fit for DJI Phantom 3 Drone; Very Sturdy Based on other reviews of this Pelican Storm Case, I bought this specifically to protect and transport my DJI Phantom 3 drone. They were correct as the unit fits perfectly (after you cut out all the unneeded foam) as well as all the accessories. No more worrying about my $1300 investment as this thing seems bulletproof. You could get one with the foam insert preformed specifically for the Phantom 3, but they cost about $$more. So save yourself 100 bucks by buying this Storm Case and cut the foam yourself. It only takes about an hour to cut it, and since my time is not worth anywhere near $$per hour, it was a no brainer for me. Rated 5 out of 5 by Rick Bennette from SOLID WEATHER PROOF CASE After investing several thousand in a camcorder, I figured protecting it was well worth what I paid for this case. The case is solid with firmly closing and locking latches and strong, reinforced hinges. The latches can not accidentally pop open. In addition to holding the full size camcorder, I was able to fit a shotgun mike, an LED light, cables, headphones, camera handle, charger and several other small accessories. This makes for a one bag trip to most sets. The cubed three layers of foam make for easy customizing of space without any two pieces of gear touching each other. I would have liked to have this in the light gray color of my other Pelican cases. The lighter color does not get so hot when the case is left in a sunny area. The black gets blazing hot, so a shady spot is a necessity here in south Florida. Rated 5 out of 5 by NoCoErik from good, light case This is a really nice case. Compared to the Pelican 1550it's just a different case. External dimensions are the same, but the Storm gets 1 more storage space inside... AND it's two pounds lighter. The trade-off is the overall fall off a truck on the highway toughness you expect from Pelican. I don't know that the sides are any thinner... but you can tell that the case just isn't as BEEFY. It's a bit more refined, yes. And for normal use, it'll be fine I think, but you do lose some rigidity (and weight). Note that the padlock ports on the Pelican 1550 are metal reinforced and on the Storm they're just the same injection plastic as the case. It's great for what it is, but if I had to throw a case into the bay with cameras in it... it would be the Pelican 1550. Rated 5 out of 5 by Anonymous from SUPER PRODUCT I purchased 2 of these cases to use for my luggage on my Suzuki vstrom motorcycle. They worked out fantastic. Best cases you can buy for the money.Also B and H gave me the fastest free shipping that I have ever received through my many online purchases. WILL DEFINITELY BUY AGAIN!! Rated 5 out of 5 by Donald from The plane Boss I use this product to carry mostly handguns, I can put 6 guns easy in it. Good size case and not to heavy, strong protection to travel on the plane. Protect your gear with 2 locks. Rated 5 out of 5 by iamthelovejoy from Already Thinking About What Else I Can Use Another Storm For I was surprised by how light the case is even with my equipment in it. And I was flat out floored by how easy (and fun) it was for me to customize my foam. I'm using the case to store and travel with DJ equipment including a mixing board, a small mixer, my headphones and all my cables and there's loads of room. I love this case and like the title suggests I'm already thinking about what else I could store and carry in a Storm case. Next purchase is probably a smaller one for my mics. Rated 5 out of 5 by NoCoErik from solid and light Love the latches. Better function than Pelican. Lighter than Pelican overall. However, this weight is traded off in that the top lid is not quite as rigid as a Pelican. I think it'll seal, but you can see a gentle arc between the top and bottom lids around the handle. Again, no evidence that it will or has leaked. Just FYI. I think it's worth the trade in weight. I have four of these. Three as motorcycle luggage and one as a case for a $$$$ video camera rig, so I do trust them. Rated 5 out of 5 by Nathan from Tough pelican I purchased this for my Ronin-m and I haven't cut the foam yet because I'm afraid I'll mess it up. But the pelican keeps my stuff safe and works Great! It is water proof so I had a little fun with that. I throught it in the swimming pool and tried to make it sink and it wouldn't. Someone said what it he doing? Does he know those things are designed to survive a plane crash? So then I put 35 pounds of weight inside it and was able to push it down 6 feet in the pool.